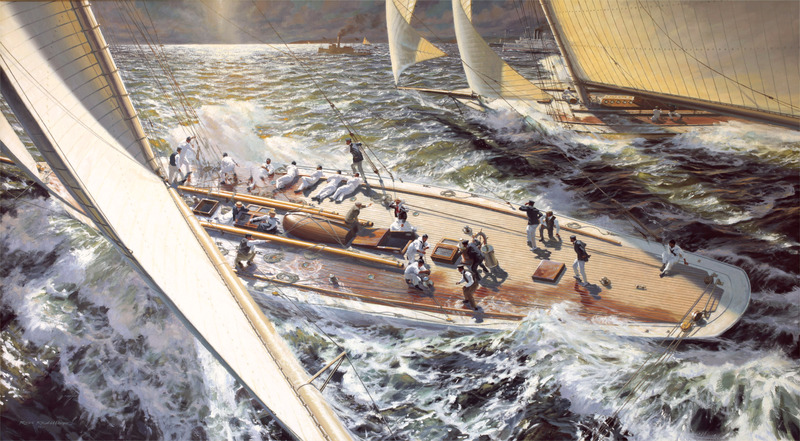 28" x 50" Oil on Panel, 2011 Having successfully defended the America's Cup in 1899, COLUMBIA was selected to compete again in 1901 against the brand new SHAMROCK II. The third and decisive race took place on October 4, with the two boats crossing the line in a virtual dead heat, the defender besting the challenger only on corrected time. Interestingly, along with Charlie Barr at the helm, and Mr. and Mrs. Iselin on board, so too were the the Iselin's two teenage nieces, Nora and Fannie, who had a first-hand view of the action. This painting won the 2011 Yachting Award at the Mystic International and was sold into private collection.